This weekend, the sounds, sights and colours of India came alive at the ‘Indian Summer Festival’ in the heart of Moscow, inspiring many Russians to try out Indian food and dream of a holiday in that country. Folk dances, bright vibrant colours, Indian food and the aroma of mehndi (henna) filled the summer air as Moscow got a taste of India over the weekend. 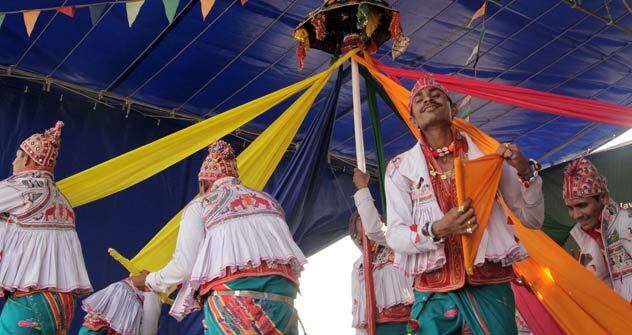 In the middle of the Russian summer, Dandia Ras Group performed folk dances of Gujarat at the open stage of the “Museon” park in central Moscow. All around the stage an Indian market stretched out, where guests could taste Indian food and drinks, buy Indian clothes, jewellery, bagatelles, aromas and books. Russian women could not resist the temptation of trying out some mehndi on their hands. Russian and Indian kids played together splashing fountain water and running around a statue of Mahatama Gandhi, the apostle of non-violence. Their parents sat together on the lawns, enjoying the performance. Indian tricolor flags fluttered in the wind all over the park. The Indian Summer Festival has become a big attraction here, drawing in droves of Russians and expatriate Indians. The festival creates a sense of bonding and camaraderie. “I hope, this opening that they have and this exposure that they have, will also encourage them to visit my beautiful country and get to know it better,” he said to much applause from an eclectic crowd of Russians and Indians.